In my earlier articles, we discussed progressive enhancement and why it’s generally a better choice than graceful degradation. This is the first of a three-part series that illustrates how to build a simple tabbed box using progressive enhancement techniques. HTML is the only layer you can rely on with any certainty. Most browsers will display something — even if you are providing XHTML 1.1 content to a device that only supports HTML 3.2. 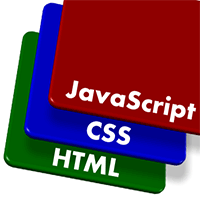 The majority of browsers offer CSS but the level of support varies. Users can disable CSS or specify their own stylesheets in preference to yours. Some browsers such as screen readers or Lynx could completely ignore your CSS. use semantic elements and attributes, e.g. h1 for your main title, p for paragraphs, table for tables of data (not presentation), etc. In the following example, we will build a tab box. The code is a simple client-side only widget, but the same concepts can be adapted throughout your development. Almost any control you can imagine will have a POSH equivalent. 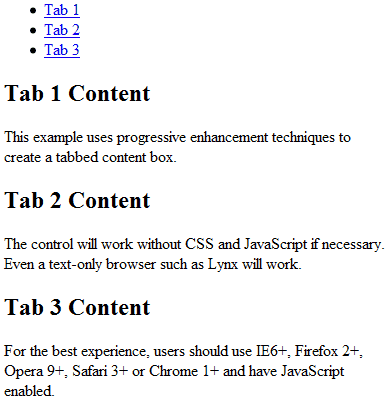 This page should work in almost any web browser with support for HTML 4.01 or XHTML 1.0. Older browsers will continue to display the content even if the links do not work as expected. In my next post, we add a the CSS layer to make it prettier and improve the usability without adversely affecting the functionality.